The Three Tarotists Who Met Hermes . . .
Once upon a time on a cold winter day three Tarotists, Bill, Jill, and Babs had a very, very, very Tower morning. On the way to the Eleventh Annual International Tarot-Cabala Correspondences Convention in Pittsburgh their car skidded out of control on an icy street and they instantly died. I told you they had a very, very, very Tower morning. Yes, Divine Hermes, Sir, I sure do, he replied. Are you wise in the traditions of Our Most Precious Book Commonly Called Tarot? asked Hermes. Yes, Divine Hermes, Sir, I sure am; Ive been a member of the Pasta Astra Golden Sunset Boulevard Temple for forty-two years, where I have been admitted to the grade of Magus Supremus, and even once summoned J. Edgar Hoover to physical appearance, he answered. Thats very heartening. Thank you for sharing. But on to more important things. Answer correctly but one question about our Most Precious Book Commonly Called Tarot, and We will open the gates of Paradise for you. Answer correctly or I must cast you into the Black Ever Rolling Abyss to suffer eternally. Tell me, my son, which Hebrew letter corresponds to the Fool? queried the Divine Hermes. Suddenly, a thundering buzzer sounded BRRRRRRT! The Divine Hermes shook his head sadly and with a wave of his wand cast Bill into the Black Ever Rolling Abyss, wherein he is required to give readings to grumpy Goetic demons using the Herbal Tarot eternally. You bet your sweet bippy, Mr. Hermes, I sure do, she replied. Bippies aside, my daughter, are you wise in the traditions of Our Most Precious Book Commonly Called Tarot? asked Divine Hermes. No sweat, Mr. Hermes. Ive read every book by the supreme magi Moses, Solomon, Trithemius, Agrippa, Dee, Lévi, Papus, Mathers, and Crowleynot to mention Your own concise but ever popular Emerald Tablet. Heck, Ive even translated it into Enochian, she answered. Thats very heartening. Thank you for sharing. But on to more important things. Answer correctly but one question about our Most Precious Book Commonly Called Tarot, and We will open the gates of Paradise for you. Answer correctly or I must cast you into the Black Ever Rolling Abyss to suffer eternally. Tell me, my daughter, which Hebrew letter corresponds to the Fool? queried the Divine Hermes. Suddenly, a thundering buzzer sounded BRRRRRRT! The Divine Hermes shook his head sadly and with a wave of his wand cast Jill into the Black Ever Rolling Abyss, wherein she is required to give readings to the spirits of former members of Hells Angels using Motherpeace for eternity. Yes, Sir, I do, she replied. Are you wise in the traditions of Our Most Precious Book Called Tarot? asked Hermes. Dont worrythis will be quick, the Divine Hermes said as he interrupted her with a waive of His hand. Answer correctly or I must cast you into the Black Ever Rolling Abyss to suffer eternally. Tell me, my daughter, which Hebrew letter corresponds to the Fool? queried the Divine Hermes. Suddenly, from golden trumpets sounded fanfares, red roses rained from the Heavens, and the Divine Hermes smiled broadly. Wisely and correctly answered, good and faithful daughter, you may enter Paradise, he said. Since that day Babs resides in Paradise where she enjoys the Beatific Vision except on Thursday evenings when she volunteers to teach remedial Cabala to the poor suffering souls in the Black Ever Rolling Abyss. Illustration (top): Hermes Trismegistus, adapted from Johann Theodor de Brys engraving in Jean-Jacques Boissards De divinatione et magicis praestigiis (c. 1616). Hermes Trismegistus was a mythical Ancient Egyptian god or prophet. According to some legends, he is the purported creator of the Tarot. 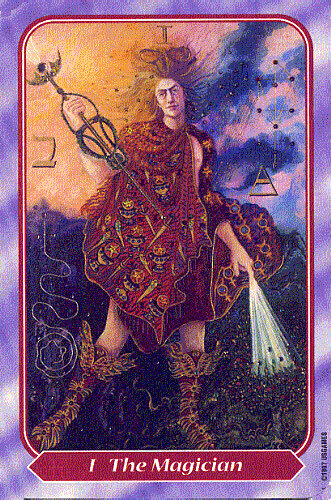 Illustration (bottom): The Magician as Hermes Trismegistus from The Spiral Tarot by Kay Steventon (copyright &COPY; 1997 U.S. Games Systems). Click on the image for a larger one. Copyright &COPY; 2000 James W. Revak. All rights reserved. Version 1.0 (2/12/00).